The Focus Fast-Track-to-Learning Seminars are invaluable and To-the-Point, giving you accurate and current information from Experts in each field on all related topics about moving to or living in Mexico. Get a guided, hands-on experience of “life at Lakeside” to see if it for you. And while our program is customized for those moving or retiring to the Lake Chapala area, the program provides essential knowledge on your transition to Mexico regardless of where in Mexico you might decide to live. Experience the outstanding beauty of Lake Chapala and learn why 20,000 Expats call this pocket of paradise, ‘Home-Sweet-Home’. Here are the 2019 dates; Registration is open now. Once you attend one of our Fast-Track-to-Learning programs, you will have all the information you need to decide if Mexico if right for you; information that can be very difficult or impossible to gather on your own. Moving to a new country can be a delightful and enchanting adventure or a daunting and frustrating task. The difference is the amount of preparation, knowledge and understanding you have before actually making the move. Knowing how to get the very most from your new life and knowing how to navigate through the system with the help of an experienced support team can make all the difference. It’s easy once you know how. Focus on Mexico can show you the way. When you decide to make the move, you will have access to the Focus Alumni Support section on our website to help you make a smooth transition and you also will be eligible for the Focus Alumni Benefits. Over and over our clients tell us that on their own, they could never have learned or experienced everything found in a single Focus program. Read our countless ‘Program Testimonials’, and see the value that others in your own situation found in our program. There simply is no better way than a Focus program to truly experience Mexico and at such an affordable price. Relocating to another country is a big move. It’s an important decision. Doesn’t it make sense to ensure you are getting accurate and current information? Doesn’t it make sense to gain knowledge and a true understanding of what it is going to be like for YOU to live there? Only then, can you be confident in your decision. Focus on Mexico gives you that. During your Focus Fast-Track-to-Learning program, you’ll hear from the Experts in their respective fields. You can rest assured that you are getting the best and most current and up-to-date information available to build your knowledge base about Mexico. And most importantly, we help you put it all in perspective. We show you how to implement it with your particular circumstances in mind. With the knowledge you will gain, you will save the cost of the program time and time again, plus you won’t have all the frustrations of the trial and error process. This is a major change in your life. Our Focus Team are dedicated to helping you make a smooth transition so you can relax and enjoy your new life adventure in our little pocket of paradise. Our new Fast-Track-to-Learning conferences provide educational Seminars from Experts (including a 200 page comprehensive workbook and handouts) as well as Registration Cocktail party, group excursions which include two lunches, a Dinner & Entertainment mixer with Focus Alumni, and a Farewell Dinner on Friday evening at beautiful Casa Bullock on Friday evening. Additional excursions during the program are available ‘a-la-carte’, allowing people to customize their own program to best suit their requirements and budget (but most participants will choose all of the A La Carte options to get the full experience of our Programs). The A La Carte tours of Guadalajara, Ajijic and Chapala are integrated into the Focus 6-Day Program so you will not miss any sessions. The Seminars are held at the Real de Chapala hotel, so for your convenience we do recommend staying right at the hotel. While the cost of accommodations is not included, we have negotiated a Focus Preferred rate of $1,606 pesos at the program Hotel which includes a full breakfast. Having breakfast with other Focus participants gives you a great opportunity to share experiences, perspectives and ideas. (To give you a price comparison, if you book the hotel through booking.com the price is about the same but does not include breakfast, and in addition to the price there is 16% IVA and 3% City Taxes.) However if you prefer, we can provide a list of Recommended B&Bs or for longer stays, recommended Property Managers. The best thing I can say is that I would recommend the Focus program to anyone even slightly interested in moving to Mexico. The general information the program provided is useful no matter where a person is interested in living in Mexico. I have read books about retiring in Mexico and done research online but I have found nothing that compares with this all-comprehensive program. I look forward to returning as a “guest” before I make the actual move to Lake Chapala. Money well spent! I’m sure you’ve received dozens if not hundreds of thank yous and glowing accolades over the years that you’ve been directing the Focus on Mexico trips, but please allow me to add my wholehearted endorsement, and sincere gratitude for your introduction to a new and most appealing way of life. The amount of information was almost overwhelming, but I feel secure in the knowledge that I now have the connections and know who to go to for what when I need it. Nothing and no one could speak more highly for the area than the first rate program you have put together, along with all the wonderful people you have put in place to so ably assist. Everyone involved is attractive, likeable, intelligent, expert in his/her area, and helpful without being “pushy”. You guys have done an amazing job of putting together a program that is both enjoyable and chock full of information. Focus ‘a-la-carte’ services, offering excursions before and during the program during scheduled ‘time-outs’ and additional activities options if you are extending past the program dates. The tours to Guadalajara, Ajiic and Chapala will help to give you a “lay of the land” perspective on the main expat communities as well as the extremely popular trip to Guadalajara on Sunday. Click on the link above see the options and price list of activities to choose from. Make your reservations as soon as possible as the buses will fill up quickly. We will also highlight local points of interest and include a list of restaurants and entertainment choices, of which there are many. The new ‘Fast-Track-to-Learning’ Conference is offered at a competitive price, thereby allowing you the opportunity to choose your accommodation, see the sights on your own timeline, and experience the area, either with our Focus ‘a-la-carte’ services or on your own, as best suits your needs. Six Days (Sunday to Saturday – Final evening Friday – check out Saturday). (Note: If you want to take advantage of the optional A la Carte tour to Guadalajara and Tlaquepaque on Sunday before registration, you will need to arrive on the Saturday). We also recommend staying over a couple of days to explore the area on your own. Resource Materials – Comprehensive Workbook (200 pages), Topic Handouts, Driving to Mexico Kit, ‘Moving your Stuff’ to Mexico Instruction Book, Eligible to sit in on educational Seminars again for free for up to 5 years from your Program dates. Presentations by Experts: Health Care, Hospitals/Doctors/Health Insurance Options, Living Lakeside, Safety/Crime, Legal, Cost of Living, U.S. Taxes, Canadian Non-Residency, Mexican Economy, Investing in Mexico, Immigration Visas, Moving, Doing Business in Mexico, Bringing Pets, Financing, Title Insurance, Currency Exchange, Real Estate – Renting or Buying, Financing Planning re Moving to Mexico, Owning Foreign Plated Vehicles, Buying a Car and more. How To’s for when you are ready to make the move. Eligible to join our Focus Best Doctors Group Health Insurance Plans – fantastic Private Health Care Group Plan. (Can join up to age 74 years 11 months. No waiting period. Pre-existing conditions accepted after 12 months). Anyone who is considering living or spending time in Ajijic or Chapala Mexico – now or in the future – should attend this program. Get everything you need in one fell swoop! 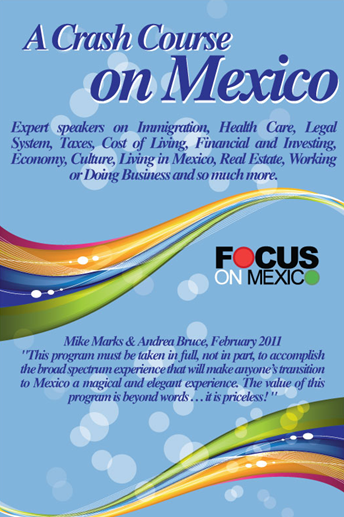 “Focus on Mexico was a great way to learn about the possibility of living in Mexico. The Focus Adventure program was designed to provide us with all the information we needed to make a decision about living here and the Focus team was able to answer all of our questions in a straight-forward and understandable way. They brought in local experts in Health Care, Immigration, Taxation, Law, Real Estate, etc. … they took excellent care of us while we were in Mexico. … They made it possible for us to see a range of local real estate, but there was absolutely no pressure on us to make any decisions….